Bajaj Capital is the proud recipient of the award for the 'Best Financial Planning Company' for the year 2011-2012, by one the leading business magazines of India. 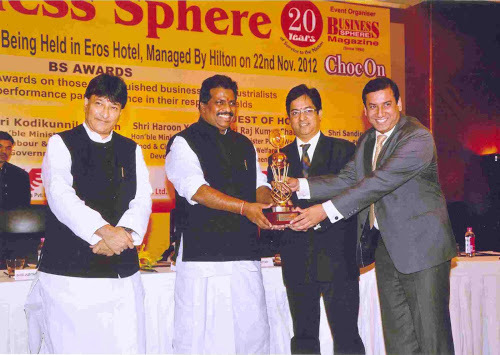 The award was presented by Shri Kodikunnil Suresh, Minister of State - Labor & Employment, Government of India and Shri Haroon Yusuf, Honorable Minster - Power, Food & Civil Supply, Development , at a ceremony organized on November 22, 2012 at Hotel Eros, Nehru Place. The award was received by Mr. Harish Sabharwal and Mr. Vishwajeet Parashar on behalf of the company. Leading companies like SMC Global, etc were among the top contenders for this award. This award is truly a recognition of the contribution made by Bajaj Capital in the area of Financial Planning. Really above given information is too good to invest money in right place.